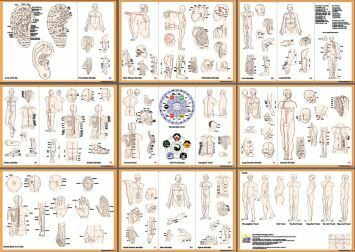 The Lung Meridian is a yin meridian and controls breath and energy. It is paired with the Large Intestine Meridian. 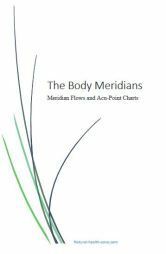 Together with the Heart Meridian it assists with circulation of the blood. Breathing hence forms a bridge between body and mind. 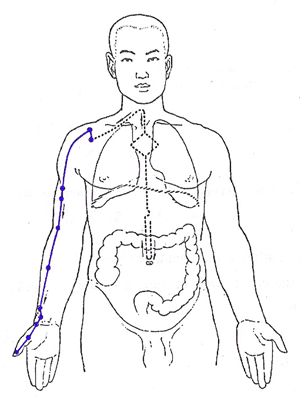 This meridian begins deep in the solar plexus region (middle burner) and descends to meet the large intestine. Winding up past the stomach, it crosses the diaphragm, divides, and enters the lungs. It then re-unites, passes up the middle of the windpipe to the throat and divides again, surfacing in the hollow region near the front of the shoulder (LU-1). From here it passes over the shoulder and down the front of the arm along the outer border of the biceps muscle. 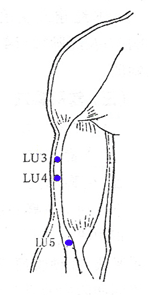 It continues down the forearm to the wrist just above the base of the thumb (LU-9). The channel crosses the height of the thumb muscle to finish at the corner of the thumbnail. The Lungs are responsible for establishing the foundation of Qi for the entire body. The Lungs house the body's Seven Emotions and are responsible for self-protection and self-preservation. Their negative attributes are disappointment, sadness, grief, despair, anxiety, shame and sorrow. 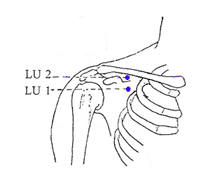 LU3 - Tianfu - Dyspnea, epistaxis, pain in the medial portion of the upper arm. LU4 - Xiabai - Cough, irritable and distending sensation in the chest, pain in the medial portion or the upper arm.